The consultation is about you. You, your unique symptoms and problems, and how they affect you. I work with you as the unique individual you are, by listening and understanding and using homeopathy to help you bring about the changes you want to make. I work holistically, which means that we look at how your symptoms affect you both physically and emotionally, the impact they have on you as a whole person. It's important that you feel heard and understood, just as I did all those years ago when I first saw a homeopath. Everything we discuss is completely confidential. So that you can make an informed choice about how homeopathy could help you, I offer a free half hour consultation to discuss this, which can be in person or by phone. I'm based in a quiet location in Maidenhead and there's plenty of free parking. My clients come from a wide area including Marlow, High Wycombe, Bracknell and Windsor, as well as further afield. Skype consultations are available, but it's good to meet new patients in person at least the first few times, whenever possible. For those who would like to know more about Homeopathy and its history, a short summary can be found below. I offer a free half hour initial consultation, so do come and see me. I'm happy to answer any questions you have. ​You can find my contact information here. 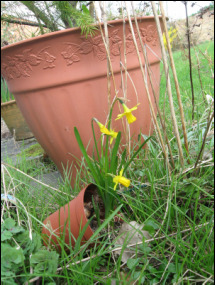 The picture below is from my garden and represents my approach to what I do as a homeopath - despite the pot having tumbled over, the daffodil is still growing, straight and true, towards the sky. Homeopathy is a complete system of natural, evidence-based medicine which treats each person as an individual. It is holistic, looking at the individual’s response to the symptoms on all levels, thus addressing the cause of the symptoms as well as the symptoms themselves. It is non-toxic so is safe for everyone, including pregnant women, babies and the elderly. The individual’s level of health is taken into account when deciding on the appropriate homeopathic remedy or remedies. It is a natural system of medicine based on the underlying principle of ‘like cures like’. This means that a substance given in a highly diluted form as a homeopathic remedy can help with the same symptoms that it would cause if taken as a material dose. This was known by Hippocrates in 400BC and developed in its modern form by Samuel Hahnemann, a German doctor (1755 – 1843). Homeopathy is a complementary therapy, and can be used alongside other medication without producing unwanted side effects. CEASE therapy is a way of applying homeopathy that was developed by Tinus Smits M.D when working with people on the autistic spectrum. It has been and continues to be developed and can also be extremely useful for working with people with reactions to specific medications and environmental toxins. There's lots of useful information on the CEASE website, here.